I don’t know why that never struck me before. Today is the beginning of Camp Nanowrimo. I signed up for thirty thousand words this month, and being a pantser, I still have not the faintest idea what I’m going to be writing about. I may wind up doing the YA with the gender-bending MC, after all. Or not. And today is also the beginning of the A-to-Z Blogging Challenge Road Trip. There are eighty-some bloggers signed up for that, and if I want to make it to all of the sites on the list, that’s about three sites a day. I intend to at least leave some kind of intelligent comment, preferably suggesting that I’ve actually read what the person wrote. Maybe they’re going to have lots of puppy pictures. So, Camp Nano, Roadtrip, and my own, self-imposed goal of blogging every day. Insecure Writers’ Support Group on the 6th. 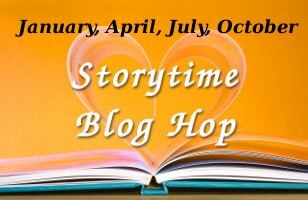 Storytime Bloghop on the 27th. Plus, of course, the novel that I’m trying to revise. Oh my! That’s a LOT of writing! Makes my twenty thousand word goal sound like a piece of cake. **grins** Yeah. I think I may have gone overboard this month. It just didn’t hit me that it was all the same month. I love a full plate! Never heard of the blogging road trip. How does one get involved?